The compact, single-beam vibrating screed allows contractors to level concrete in a variety of applications, including garage floors and driveways as well as in confined areas. The BV30’s interchangeable blades, lightweight aluminum body and rigid screed blade provide maximum versatility, easy handling and stability. Atlas Copco exhibited the BV30 vibrating screed at World of Concrete, which took place in Las Vegas on 3 – 5 February 2015. The BV30 brings versatility to each job site with its variety of blade sizes. This permits contractors the flexibility to use the screed on both small and large-scale jobs. The BV30 weighs as little as 28 lb and is available with five blade sizes, ranging from 6 to 14 ft long. The variety of blade sizes gives contractors the flexibility to use the screed on both small and large-scale jobs. The screed is equipped with a V-shaped, rigid bottom plate that prevents the blade from twisting to ensure stable and consistent levelling. And because the screed vibrates, it eliminates the need for pokers while leveling concrete as deep as 5 in. This single-beam vibrating screed offers a height-adjustable, foldable handle for easy operation and transportation. 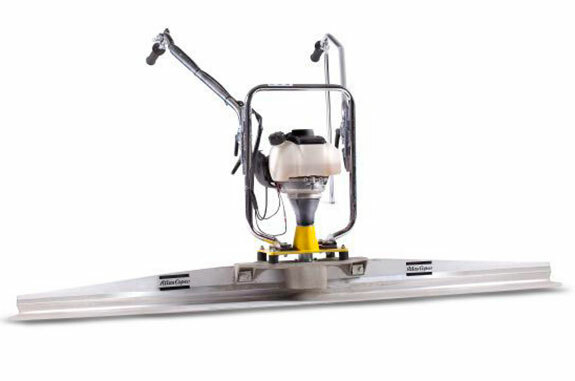 It can be maneuvered by one operator and includes unique features, such as an adjustable centrifugal force of the screed. This feature is ideal for efficient levelling of nearly any type of concrete. The BV30 is equipped with a Honda GX35 Mini 4-stroke engine, which operates quietly with as few as 108 decibels. This unit also includes a vibration damper between the engine and the handle that minimises hand and arm vibrations. Operators can easily clean the screed with water and a stiff broom, which ensures it is easy to handle and operates efficiently on the next job.